A “pop-up” listening device (archival marine acoustic recording unit) being deployed off the coast of Massachusetts. This autonomous recording unit continuously listens for and records ocean sounds. Image Credit: Denise Risch, NEFSC/NOAA. The use of passive acoustic monitoring (PAM) has increased with the availability of relatively inexpensive devices to record large amounts of acoustic data on marine animals. One type of passive acoustic sensor is the archival marine acoustic recording unit (ARU). Archival refers to data that are collected and stored by the unit for analysis after the instrument is recovered. Many different ARU systems have been developed to detect and record the sounds of vocalizing marine animals, providing information on the distribution of these animals, including those that are otherwise difficult to study. The recording packages vary widely in their size, configuration, and length of deployment. Several can be deployed together, as an array, to make it possible to detect, localize, and track vocalizing marine mammals or fishes. ARUs can be deployed in remote and/or extreme locations, such as ice-covered polar regions, and can be incorporated into ocean gliders. An understanding of the acoustics and behavioral ecology of each species in question is needed to effectively interpret and apply ARU data. Without an understanding of a species’ acoustic repertoire, calling behavior, and/or seasonal and geographical variations in call usage, no clear scientific or management question can be resolved. Scientific and management questions are being addressed by integrating passive acoustic data from multiple instruments. 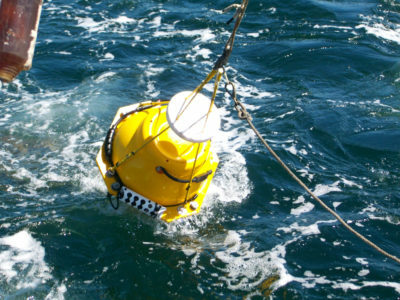 These networks include the U.S. NorthEast Passive Acoustic sensing Network (NEPAN; https://www.nefsc.noaa.gov/psb/acoustics/psbAcousticsNEPAN.html) and the NOAA/NPS Ocean Noise Reference Station Network (https://www.pmel.noaa.gov/acoustics/noaanps-ocean-noise-reference-station-network). People and Sound: How is sound used to study the distribution of marine fishes? People and Sound: How is sound used to estimate marine mammal abundance? People and Sound: How is sound used to study coral reefs? Autonomous Recorders – HARPs and ARPs, (n.d.). Scripps Whale Acoustic Lab, Available: http://cetus.ucsd.edu/technologies_AutonomousRecorders.html. Cornell Bioacoustics Program, Endangered whales heard for the first time in waters around New York City. Cornell Lab of Ornithology, Blue Whale Heard Singing off New York Coast. Hatch, L.T., and Wright, A.J. (2007). “A Brief Review of Anthropogenic Sound in the Oceans,” International Journal of Comparative Psychology, 20, 121-133. Širović, A., Hildebrand, J.A., Wiggins, S.M., and Thiele D. (2009). Blue and fin whale acoustic presence around Antarctica during 2003 and 2004,” Marine Mammal Science, 25,125-136. Smith, D., Ears in the Ocean. Oceanus (WHOI)Soldevilla, M.S., Wiggins, S.M., and Hildebrand, J.A. (2010). “Spatio-temporal comparison of Pacific white-sided dolphin echolocation click types,” Aquatic Biology, 9, 49-62. The Ecological Acoustic Recorder, A Powerful Tool for Monitoring Coral Reef Ecosystems, (n.d.). Pacific Islands Fisheries Science Center, Available: https://www.pifsc.noaa.gov/cred/ear.php. Wiggins, S.M. (2009). “Engineering Tools for Studying Marine Mammals. Frontiers of Engineering: Reports on Leading-Edge Engineering from the 2009 Symposium.” National Academy of Sciences. Koschinski, S., Diederichs, A., & Amundin, M. (2008). Click train patterns of free-ranging harbour porpoises acquired using T-PODS may be useful as indicators of their behavior. Journal of Cetacean Research Management, 10, 147–155. Sousa-Lima, R. (2009). A review of fixed passive acoustic monitoring systems. Presented at the Workshop on the Status and Applications of Acoustic Mitigation and Monitoring Systems for Marine Mammals, Boston, MA.